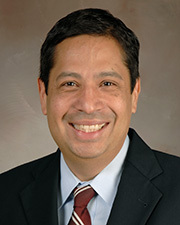 David Aguilar, MD, is an associate professor in the Department of Internal Medicine, Division of Cardiology at McGovern Medical School He has a dual appointment in the Department of Epidemiology, Human Genetics, and Environmental Sciences at UTHealth’s School of Public Health. Dr. Aguilar has advanced training in non-invasive imaging, including echocardiography and nuclear cardiology. He is a Fellow of the American Heart Association. He has been an associate editor and on the editorial board of multiple journals. He has been the principal investigator and co-investigator in multiple grants from the National Institutes of Health and has been actively involved in clinical trials testing new treatment strategies in cardiovascular disease. His research interests have focused predominantly on the impact of cardiometabolic disease (including type 2 diabetes mellitus) on health outcomes. Dr. Aguilar has authored and co-authored more than 70 publications and book chapters. As a native Houstonian, Dr. Aguilar is active in the community, previously serving on the Board of Directors for the American Heart Association in Houston. He is also active in teaching endeavors, both locally and nationally.